In light of the worst weather and storms in centuries, one could suppose it was climate change effects, or some point to HAARP. But are the conspiracy theorists crazy for believing this? It sounds sensational, but no, they aren’t crazy; HAARP is very much capable of controlling the weather. The idea of earthquakes being created is explained by Dr. Begich on Coast to Coast AM. He said that the quakes can be generated by using the earth’s energy. Micro-quakes constantly happen along fault lines, and when there is no energy releasing along that fault line, that’s when there’s a problem because it’s building it up now. HAARP produces a little energy to release a giant amount of energy (e.g. an earthquake) like a bullet primer or bomb. The other big conspiracy theory related to HAARP is the ability for mind control. This takes a bit more digging to understand. So what do these mean? First we must understand what the ionosphere is. The ionosphere is part of the upper atmosphere that is ionized by solar high frequency electromagnetic radiation (ultraviolet and x-ray radiation). It exists between 50 to 300 miles above sea level and resides higher than any function we associate with (e.g. flying in an airplane, hot air balloon, etc). The atmosphere is thin enough here to allow it to ionize. It is referred to as “ionized” because it has excess electrons that give it a negative electrical charge (the protons and electrons are not in balance-this is how electricity works). This ionized is by definition considered plasma. The ionization of the plasma depends on the energy being displaced by the Sun. More sunspot activity equals more radiation, which equals more ionosphere activity. Basically put, the ionosphere is large mirror that can reflect signals so that you can send energy to other points on the globe. The most understood use of the ionosphere is with the AM radio. AM Radio waves originate at a transmitter antenna at the radio station, then bounce off of the ionosphere (referred to as Skywave) and into the receiving antenna. These waves can be degraded during geomagnetic storms or ionosphere disturbances, when the signal gets scrambled up into the ionosphere instead of cleanly reflecting off of it. The sunlit side of earth has more charged ions and therefore more dense, and it degrades AM signal, that’s why the night time provides clearer and much further away signals. AM radios can transmit using only a certain rating of power as determined by their license. For instance, AM radio stations will be able to transmit using anywhere from 250 to 50,000 watts of power. The transmitter used by HAARP uses 3,600,000 watts. That’s up to 14,400 times the power used at an AM radio station. So how can we tell if it works in reverse? Can a thought be transmitted into our brains? Jesse Ventura’s show ‘Conspiracy Theory’ proves this works through an experiment with Dr. Nick Begich. Mind control happens at the low frequencies of 1-20Hz, because that is the frequency range of the human brain in alpha waves. The frequency following response (FFR) is a phenomenon that means the brain will try to follow the frequency it is presented. If HAARP presents a 7Hz wave, the brain will try to mimic that. This idea is discussed in the 1995 paper ‘Electromagnetic Induction of Fundamental Algorithims’ by MA Persinger. Persinger is an expert on the mind and he said that it is possible to create a signal that hyper-agitates people and creates anxiety. The media could work in conjunction with this to play on that anxiety and release fear based content to directly agitate the people’s anxiety. One can see that if you wanted to push through some sort of legislation, you could use fear and HAARP to do this (David Icke’s Problem-Reaction-Solution). Overall, this short investigation into HAARP proves that some of the theory is plausible. Whether or not it can happen on a large scale is unknown by us, but the government surely knows since they could potentially be working this on that scale. Dr. Begich explained that the HAARP design has changed since the increase in computational power (following Moore’s Law and Ray Kurzweil’s exponential trend of technology), so the capabilities are unknown to citizens. 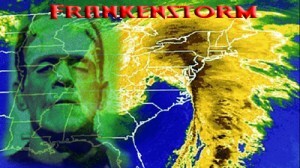 HAARP Engineering ‘FRANKENSTORM’ Hurricane Sandy – CAUGHT on SATELLITE and RADAR!!! In the first half of Monday’s show, four separate guests offered commentary and analysis on the superstorm, Hurricane Sandy, which hit landfall in New Jersey earlier in the evening. Researcher Nick Begich spoke about the technology of weather modification, and how weather control could be used as a weapon that has a kind of built-in ‘plausible deniability.’ While it’s possible a technology such as HAARP might have been involved with Hurricane Sandy, it would be impossible to say for certain without independent monitoring, he noted. Author Whitley Strieber discussed how the Arctic melt this summer was extraordinary, and this has led to warming waters and bringing the Gulf Stream further north, which contributes to extreme storms further north. He also compared the storm to the one he and Art Bell wrote about in their book The Coming Global Superstorm. Next up, physicist and author Stan Deyo shared details about an intriguing coincidence. In 1997, a practice drill related to a huge hurricane hitting the Northeastern US was conducted, and they used the name Hurricane Sandy. Deyo also called attention to a HAARP signal status chart from October 28th, which showed an intense hotspot in the northeastern US, and offered preparedness tips. Prophecy expert John Hogue related the storm to the astrological event of Neptune returning to Pisces in 2012– Neptune is the ruler of floods and quakes, he noted. Hogue believes we are in the midst of a “climate cascade,” which may really be set into motion by 2016-2017.